Remote viewing will be available from multiple locations. Emory physicians, faculty, fellows and residents will gather in Emory University Hospital auditorium Tuesday, March 13 from noon – 1 p.m. for a grand rounds discussion on this year’s severe nationwide flu outbreak. 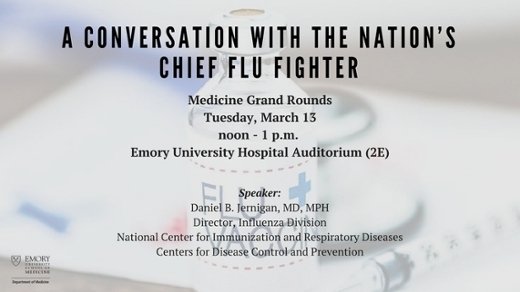 Daniel Jernigan, MD, MPH, director of the influenza division at the Centers for Disease Control and Prevention (CDC), will lead the discussion on the deadly flu season, as well as the CDC’s effort in understanding and detecting the virus. The grand rounds is sponsored by Emory's Department of Medicine. This season’s flu epidemic, which so far has accounted for more than 2,400 hospitalizations in the metro Atlanta area and 118 deaths in Georgia alone, has brought record numbers of patients into emergency departments across the city of Atlanta and the state. According to the CDC, 37 children have died from the flu this year in the United States. It has been the most severe flu season since the swine flu pandemic of 2009. 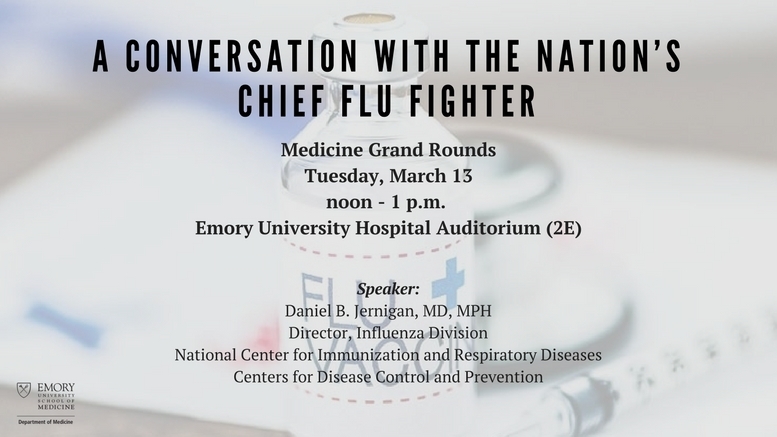 As the nation’s chief flu fighter, Jernigan will share his first-hand experience in fighting different types of influenza viruses, and answer questions from the audience during the one-hour grand rounds. This event is free and open to the public. For more information, please visit medicine.emory.edu. Emory Department of Medicine Grand Rounds are lectures designed to keep doctors and other health care professionals informed on medical challenges and advances that may fall outside their core practice. Grand Rounds are held in the Emory University Hospital auditorium (2E) every Tuesday from noon - 1 p.m. Medicine Grand Rounds are free and open to the public unless otherwise specified. Recordings of past presentations are available on YouTube. Contact deptofmed@emory.edu for more information.